HG Contemporary presents a solo exhibition by multimedia artist Laura Kimpton. “If WORDS could SPEAK,” the title of the exhibition, considers the multivalent interpretations of words in text, speech, and sculpture, as they gain increasing importance through technology. The exhibition will include Kimpton’s Monumental Words sculptures, a bedroom installation and performance, an installation of monkey busts wearing the artist’s jewelry, and mixed media two-dimensional works. Kimpton will activate the exhibition with performances and on-site art making. There will be an opening reception on Thursday, May 4 from 6-8 pm. “Laura’s pieces stand alone and have an incomparable impact on all who experience them. Her art spreads positivity and encourages expression of self that Laura herself lives by in all aspects of her personality and work,” says Philippe Hoerle-Guggenheim, founder and director of HG Contemporary. For this exhibition, Kimpton will debut a new series of Word Search pieces, which are composed of colorful salvaged metal letters from Indonesia. The three-dimensional tableaus, adorned by Kimpton’s birds, will engage viewers in word play. Also on view will be Kimpton’s mixed media works including The Way Women Do It, Her Words, and the artist’s self-portraits as birds. The pieces combine elements in an assemblage style reminiscent of Rauschenberg. Kimpton explains, “We give words so much importance in our lives and relationships, but when I create art using words I make them even more powerful. 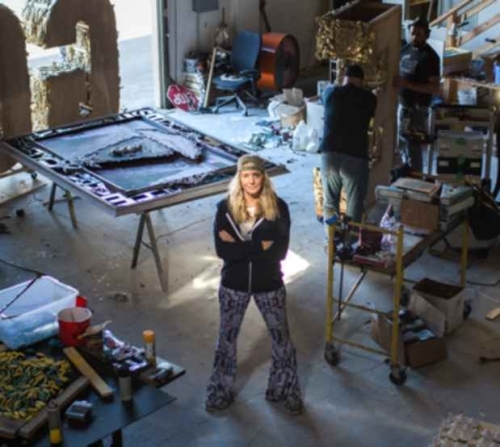 Then they do speak…they come alive.” The artist, who is dyslexic, fully understands the power that words hold and regains control of them through her sculptural works.